Topics: Best Sellers, Occasions, Just Because, Anniversary Flowers, Birthday Flowers, and New Baby Flowers. The site has about 12 users daily, viewing on average 1.60 pages each. bucketsflowers.com Welcome To Buckets Fresh Flower Market! It is hosted by Att Lincroft Ort (New Jersey, Middletown,) using Apache web server. It has 2 DNS records, any2.dnshosting.com, and any1.dnshosting.com. 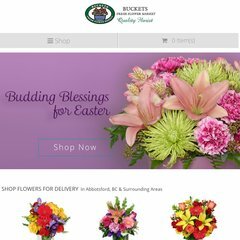 Abbotsfordflowershop.com's IP address is 12.228.94.216.